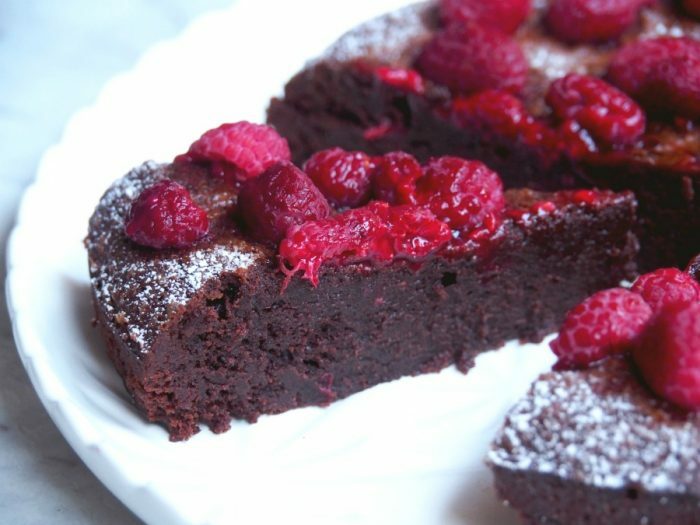 This cake is more dessert than teatime treat and it’s rich, dark and full of fudgy delicious. I discovered Tash’s recipe on Facebook not long after I got my Thermomix. It was love at first sight and of course, it was love at first bite. In fact this recipe is so good, that it made it’s way into the Official Thermomix Cookbook Best of Our Recipe Communities. I have to confess, I had forgotten how much I loved this cake until I recently made it for my friend Rachel’s birthday. As luck would have it, she works around the corner so we can regularly get together and set the world to rights. Rachel was coming round for a light lunch a few days after her birthday and there had to be cake , because Julia Childs was right, a (belated) birthday without a cake is just a meeting. 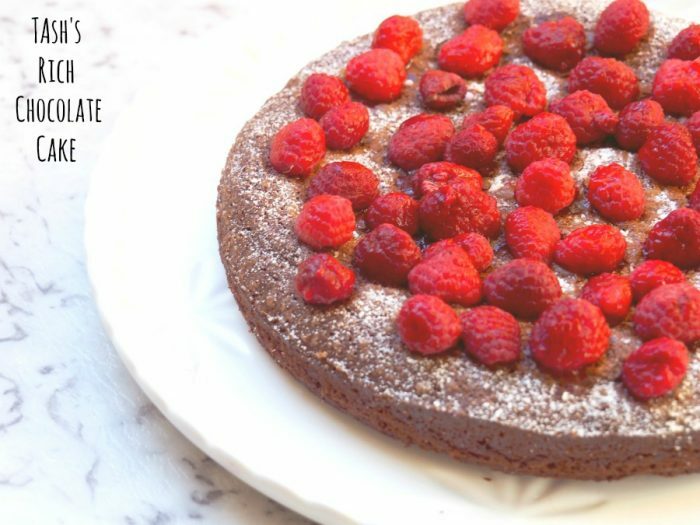 I had to think of a cake that was gluten free, could be made ahead and looked as pretty as a picture, and this cake ticked all the boxes. I don’t use gluten free flour very often and I’m still getting used to my new oven so I had no idea how the cake was going to turn out. As it happens, we got in to a gluten free flour discussion over lunch and Rachel was telling me that generally, she uses half the amount of gluten free flour required in a recipe. This was a discussion I should have really had before I made the cake because I used the full caboodle in this recipe. However, I needn’t have worried, the cake was cooked to perfection, dark, fudgy and very, very chocolatey. 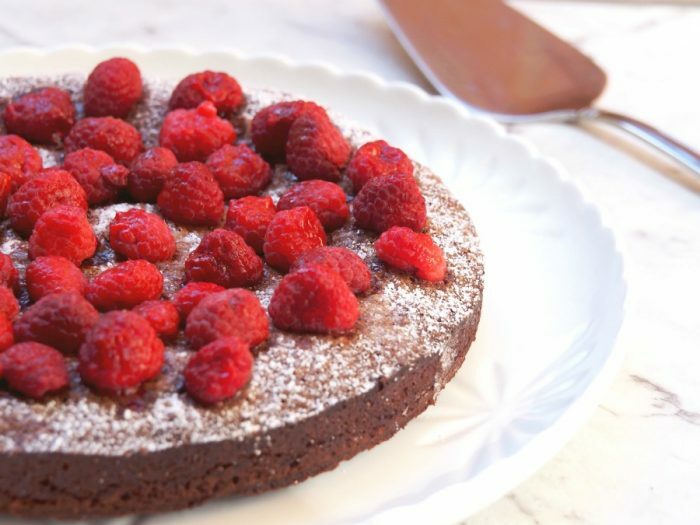 This cake is dark, dense and decadent not unlike a mud cake and not only does it make a great birthday cake, it makes a delicious dessert too. 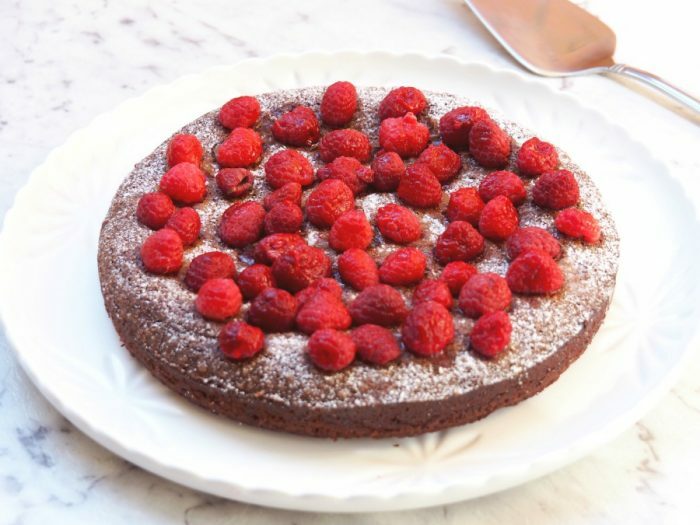 The cake is best enjoyed cold as it almost sets when it is cooling, giving it a fantastic fudgy inside with a chewy sugary crust and is delicious served with some cream or ice cream on the side. If you want to be doubly decadent, cover the cake in chocolate icing or chocolate ganache. As Rachel was in the middle of her birthday festival, she was almost all caked out, so after her birthday slice she kindly took the cake back to the office to share with her colleagues. Because sharing is caring, right?! Do you agree with Julia Childs about birthday cakes? Have you ever baked with gluten free flour? Preheat the oven to 190C/170C fan-forced. Lightly grease and line the base of 20cm springform tin with baking paper. Place chocolate, sugar and butter in TM bowl and melt for 5 minutes at 60C on speed 2. Don’t worry if all the sugar hasn’t dissolved, just make sure that the butter and chocolate have melted. Add flour, salt and eggs and mix for 15 seconds on speed 4. Pour into prepared cake tin and bake for 20-30 minutes. It’s ready when a skewer inserted in the middle comes out almost clean. 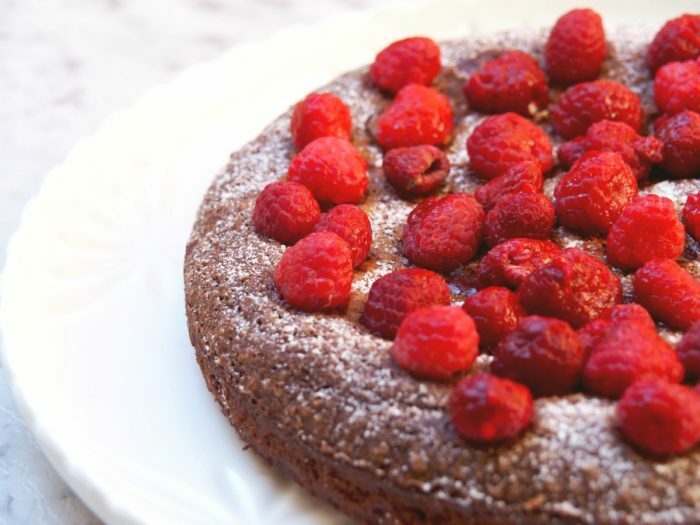 Dust with icing sugar and garnish with raspberries before serving.